Southern Barton Heights Community Association December Trash Clean Up and Meeting! Who: Residents, renters, home owners, business owners, etc. in the Southern Barton Heights area! Bring your community questions, concerns, ideas, and enthusiasm to make Southern Barton Heights a better neighborhood for all residents! Community Trash Clean Up Day!! The Southern Barton Heights Community Association is organizing a Community Trash Clean up day! We will be getting pick-up sticks and trash bags from the city and meeting at 3pm at the corner of Poe St. and Lamb Ave. (in front of Triumphant Baptist Church where are monthly meetings are held). Please bring your neighbors and help us clean up a section of the neighborhood and spend time with eachother. We plan to be out there for 2 hours, so dress to stay warm! We will focus on the areas of Barton Avenue, Lamb Avenue, and the alley between. The more people who come out the more we can get done! We will organize the next Community Trash Cleaup Day at our December meeting on Tuesday Dec. 11th at 6:30 pm at Triumphant Baptist Church. 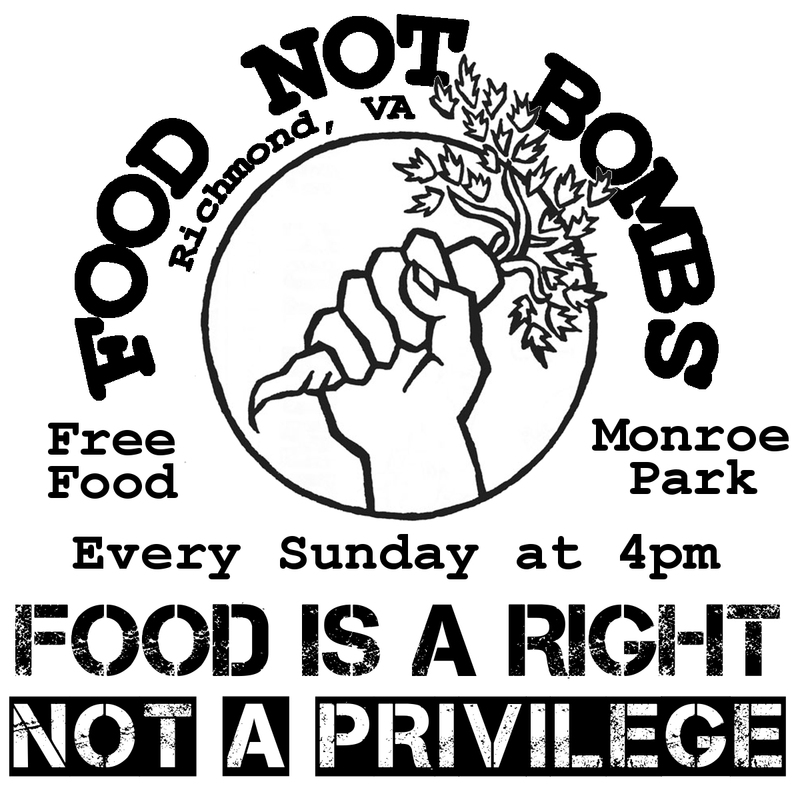 Richmond Food Not Bombs will be holding a monthly organizational meeting on Sunday Dec. 2nd at 1pm. Please come out if you are/want to be invilved with Richmond Food Not Bombs! Don’t forget- you have the right to film and record the police! Contact us if you or your organization would like to discuss how to do Copwatch! Here are links to a few individual sections of the Richmond Police Department’s General Orders, and then a link that contains 285 files of General Orders. These General Orders do not contain the type of information which was prohibited in the injunction received by activists earlier this week. So even though all of the police files were taken off of a previous upload website, these ones should not have been, based on the language of the injunction. The injunction is concerned about confidential information, which they define as personal information such as names, addresses, telephone numbers, and information about undercover agents. None of this type of information is in the General Orders. Please download and share these General Orders, to better keep the police accountable to the public. Here are copies of the legal injunction served to Mo Karnage on Friday Nov. 16, 2012. The copies that were served to the Wingnut were delivered by a Federal Marshall with at least 2 cops, who arrived in a black SUV with tinted windows. This is of similar content to the injunction others such as Nathan Cox with Virginia Copblock received. After searching through the entirety of the leaked documents using keywords I’m fairly satisfied that I’ve at least scanned through all of the material. A lot of the files turned out to be duplicates or older versions so there wasn’t actually all that much to go through. Most of the documents were pretty short and easy to digest, but I think we’ll still need help getting everything relevant out of the 110 page “Emergency Operations Plan” document which is marked in red as “Exempt from FOIA.” Many of these police general orders aren’t really news, and there is honestly a lot of fairly benign material in here. Though not particularly incriminating, the release of this information is still a victory for advocates of transparency and accountability in our public servants. Knowing their modus operandi and internal rules should help political activists and regular citizens alike deal with the police from a more knowledgeable and therefore empowered position. Despite the banality of the bulk of the leak, documents of likely interest have been set aside for your consideration to save you time if you don’t want to dig through a bunch of bureaucratic language to find them. The quarterly reports and dispursement documents had a couple of interesting pieces of information in them. There is some less-refined employee input here (in contrast to the general orders) that is very telling. I took a couple of notes looking through these files and was particularly taken back by the nonchalant admission that police regularly interact with gangs supposedly in an attempt to win confidence, gain information, and build profiles on members. And by interact, I mean buy drugs and guns. Taxpayer money from the “Investigative Fund” requested by Captain Marty Harrison IV of the Special Investigations Division (SID) is admitted in correspondence to be intended for firearm and narcotics purchases from gangs, as well as for the paying-off of informants! These are not sting operations. Chief Norwood seems happy to grant the requests for $25,000 and $30,000. Is perpetuating a war on drugs worth this kind of routine expense? Finally, I found language about a database system called “CrimeNTel” and a methodology mentioned as “Problem-Oriented Policing” to be worth noting. Homeland Security apparently works with police to use this software to track criminal complaints and general information about suspects or those with histories. It’s noted that it’s unverifiable and inadmissible as evidence in court, but they’ll still use it to keep an eye on you. For those attempting to make FOIA requests for information from the police, please see the file named “Public Information Requests” for detailed information about their policy for honoring them. Please see the original documents uploaded here for context and more details. See something we missed? Email http://virginiacopblock.org or http://wingnutrva.org and send us a tip. The Richmond Comedy Coalition’s all-improvised monthly show series, Richmond Famous, features live and totally unscripted comedy, created on the spot, inspired by the true stories of some of RVA’s most interesting people. The improvisers will be hearing their guests’ stories for the first time onstage and what unfolds afterwards is as much a mystery to them as it is to you, creating a show so funny you’d swear it was scripted (but you know it’s not). Food Not Bombs is a loose-knit group of independent collectives, serving free vegan and vegetarian food to others. Food Not Bombs’ ideology is that myriad corporate and government priorities are skewed to allow hunger to persist in the midst of abundance. To demonstrate this (and to reduce costs), a large amount of the food served by the group is surplus food from grocery stores, bakeries and markets that would otherwise go to waste. This group exhibits a form of franchise activism. Join the Wingnut Anarchist Collective in January! We’re back down to having 3 folks living at the Wingnut full time; 3 is a good number when it comes to living together happily but it puts a limit on our ability to organize effectively. We can run all of the projects that we’re currently committed to but we can’t grow and do new things without more people actively participating. Also, we have a lot of friends that come over and help out with stuff that we do in a variety of contexts who don’t always get the input or the credit that they deserve for the work that they do. One of the potential solutions that we’ve discussed for dealing with both of these problems is splitting the political organization off from the residential organization. The folks living in the house would all be members of the political side, but the political side would also be open to people who either couldn’t or wouldn’t live at the wingnut. If you’re reading this and are interested in participating, you probably already have a good idea of who we are and what we’re about, but we’re going to put together more information about what this might look like that will be on the facebook and website in a week or so. We’re gonna have a meeting on Monday January 28th to try to hash out the particulars of what membership would be like, a statement of purpose and so on. Feel free to get in touch with us with any comments or concerns that you have leading up to the actual meeting. Today Mo Karnage and Nathan Cox were served with injunctions from the Richmond Police Department. The injunction documents were very vague, and seemed to be about the files recently linked to by Mo and Nathan on 2 websites- Copblock and Wingnut. Important to note, is that typically injunctions are served by a process server. To have multiple cops hunting you down (they went to Nathan’s work, home, and mother’s home as well as Mo’s home, mother’s home, and friend’s home), some wearing tactical gear, is a pretty obvious intimidation tactic. We are working on getting scans of the injunctions to post online for your viewing pleasure. The City of Richmond Police Department is labeled as the plaintiff. The injunction doesn’t say which files are the ones in question, just all of them. It appears that the police have now taken all the files down. It looks like the RPD files that we linked to were taken offline at some point today. If they are online under a different link somewhere please let us know. In the meantime, there are other RPD files that Richmond activists have acquired over the years. So you can check them out. Learn the police’s rules in order to hold them accountable!